Trampoline springs: Do they make a difference? Do trampoline springs make a difference? Aside from the obvious fact that without springs, there can be no trampoline, there are several important attributes to a spring that greatly impact the jumping experience. They provide the bounce obviously, but trampoline springs also play a very important role in the safety of the bounce. 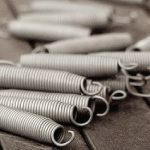 The physical features of a spring like length, diameter of the coil and the material they are made of combine to make a spring perform a particular way. Energy transfer is what a jumper feels moving through their body when jumping. If your trampoline springs are able to stretch further, the energy transfer through your body takes place over a longer period of time, resulting in extra energy that can be put into your jump. You may feel this overall as a “smooth bounce”. If your trampoline springs are short they simply cannot stretch as much, so the energy transfer is faster, and your body has less time to absorb it and the feeling is a shorter, stiffer, and harsher bounce. A short spring length equals a short stretch distance, which equals a short stop rebound; and will have two results; one now and one eventually. It will stop stretching, and then, eventually deform permanently (the spring will be permanently overstretched and lose much of its function). When it stops stretching, you’ll feel a very sudden stop in the downward motion of the jump mat, similar to jumping off a short wall and landing on the ground. Remember all the trampoline springs attached to the mat are doing the same thing. These “short stops” are very hard on your joints and back. A permanently deformed spring is the inevitable result from constant over extension during use. It often occurs where the users are too heavy for the design, or jump in a manner contrary to the instructions and design limitations inherent in short springs. This usually occurs when a low-cost trampoline is involved. Short trampoline springs are cheaper to make, are often made with lower quality steel, and simply “give out” sooner than a higher grade counterpart. How do trampoline springs help with an awkward landing? This all gets back to energy transfer. If the energy transfer is slightly slower, your body can absorb and transfer the energy from the trampoline springs more consistently without sustaining injury. As you look at the spring summary on our compare trampolines page, you’ll see trampoline springs with slower energy transfer receiving a higher rating. In contrast, a spring with a longer coil has a longer stretch length. The quality of the wire used also affects the stretch and energy transfer rate. A higher quality spring is more expensive, but has a smoother superior stretch and is generally longer lasting. That translates to a higher priced but better performing trampoline. The diameter of the spring coil can also affect the quality of the spring stretch. The “fatter” or larger diameter the spring, the more wire is used. So, if two springs are the same length, the fatter spring will generally have the better bounce. Any spring shorter than 7 inches should be avoided. 7 inch springs are fine but will not be as smooth or enjoyable for heavier or harder use jumpers like young teens and older. The better springs range in length from 8 to 10 inches, with the longer spring being superior if all other factors are equal. 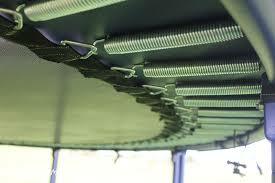 Remember also that spring wire quality and diameter of the coil also affect the performance of the longer springs. Buy the trampoline with springs that will be good for the long haul. Short springs, even in the 6 inch range may be fine when children or very young and have a light body weight, but as they grow, they will stop enjoying its bounce which will be increasingly harsh and lower performing. Finally, for safety in an awkward landing, having a slower energy transfer reduces the chance of injury and is overall easier on your body. All of these factors combined: the length, diameter and grade of wire used, work together to determine the quality, safety and comfort of the bounce. Look for springs on our compare trampolines page with a higher number for a safer energy transfer.